I'm baaaaaaacck! Life got in between the computer and me, but I could not be more grateful for the opportunity to step away and experience it all. My college boyfriend and I got engaged (!!!!!!! ), we celebrated, we ventured to the New Jersey shore with friends, my older sister and cutest niece moved to Iowa, and my family traveled to the North Woods of Wisconsin for the 4th of July. As much as I crave routine and predictability and general "me time," these last several weeks threw all of that to the wind. My normal cooking routine went with it, as did those trips to the weekend farmers' markets that I look most forward to. I caught myself several times wishing that I could just escape, get away from all the movement. But then I would remember that it is a wonderful, unique opportunity to be surrounded by so many loving people, that life will once again pull us away into all of our own little spheres and I will be craving movement, excitement, and spontaneity as much as I have been craving calm, quiet, and routine. I have often recalled the words of one of my favorite yoga instructors. She reminds us that it is easy to foster inner calm and peace when you are able to control every element, when you physically remove yourself from the external chaos. The challenge lies in finding that internal peace amidst chaos, amidst change, amidst an environment you cannot control. Here's to summer, here's to embracing that chaos but finding even a snippet of inner calm, and here's to finally getting back into the kitchen. Since I have been away for a while, I thought I would come back with a BING...I mean, a BANG! Well, a bing and a bang! Dark Bing cherries that is. And a bang because this dish is a total winner. Cherries have a fairly short season, so you have to get them while you can. As a kid, I used to have cherry pit spitting contests with my siblings, and as an adult, I resort to experimenting with cherries in the kitchen since launching cherry pits as far as you can is not nearly as fun when you are alone. This delightful dish mixes sweet, juicy cherries, with salty, chewy Halloumi. Halloumi, which traditionally comes from Cyprus, is one of those special squeaky cheeses, like the Indian paneer, that holds its shape when heated and does not melt. It is intensely salty, but the fruity vinaigrette, nutty bulgur, and bright herbs really help balance everything out. This recipe is incredibly versatile. If you cannot find halloumi, you can substitute paneer or add some marinated tofu that has been crisped in the skillet. You can also just sprinkle it with a generous amount of salty (uncooked feta). If bulgur is not in your pantry, use another cooked grain you like such as quinoa or brown rice- aim for about 2 1/2 cups cooked grain total for the dish. Parsley can substitute for the cilantro and toasted hazelnuts or almonds for the toasted walnuts. Another idea? Toss in some cooked chickpeas. Cherries are the real star here. Pureed into the vinaigrette and some left in bigger pieces, you can appreciate their mild sweet-tartness fully. Look for dark sweet cherries at your market or grocery store. I try to get organic as they are a fruit in which we eat the skin. Give them a good wash, and snack on a few while you are cooking. I really hope you enjoy this dish as much as we have. Cook the bulgur. Bring 1 and 1/4 cups water to boil over high heat. Add 1 cup of bulgur, cover with a lid, and reduce heat to very low. Cook for 10 minutes. Remove from heat and allow to rest for 10 minutes before removing the lid. Drain any excess liquid. Meanwhile, make the vinaigrette. 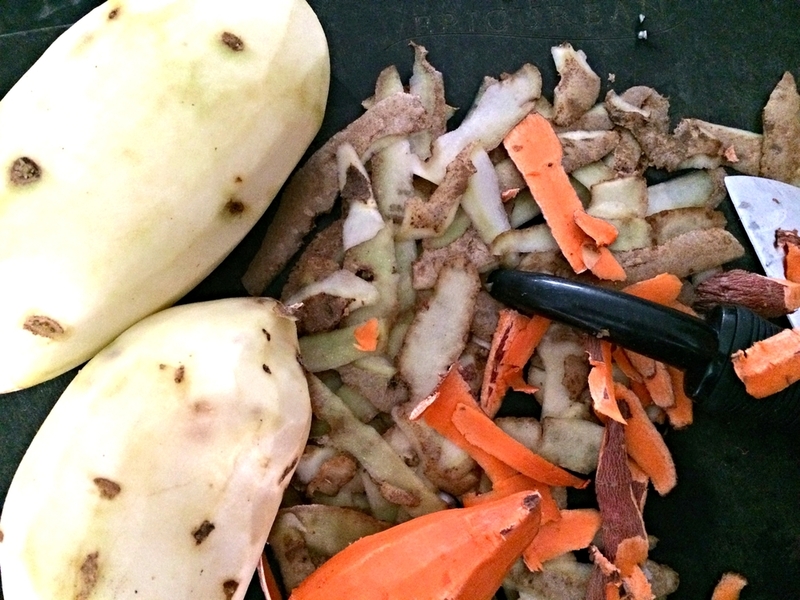 In a blender or food processor, add the vinaigrette ingredients and process until smooth. It will be a beautiful pink color. Set aside. Cook the halloumi. Heat 1 tablespoon olive oil over medium heat in a nonstick or cast iron skillet. Add the halloumi slices in a single layer and cook 3-4 minutes per side or until golden. Remove from heat. Assemble the salad. 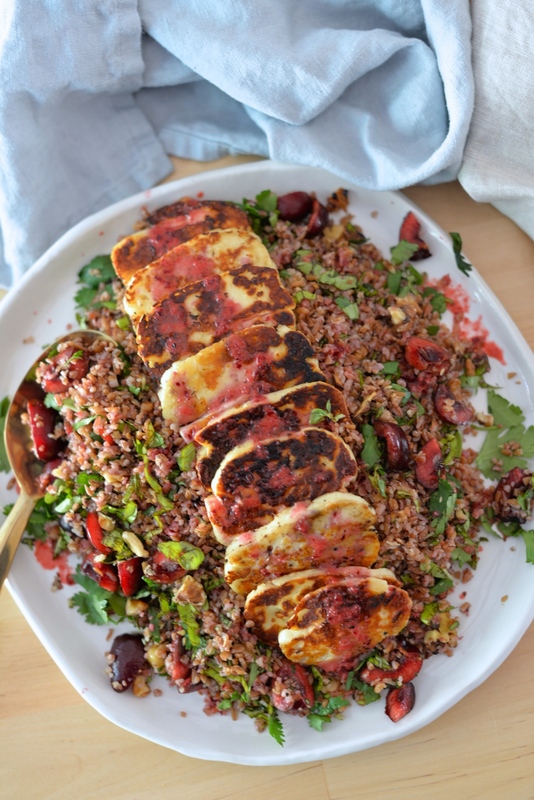 Toss the bulgur with the vinaigrette, reserving a tablespoon or so for drizzling atop the halloumi. Add the chopped cherries, herbs, and toasted walnuts. Mix to combine. Season to taste with salt and pepper, remembering that the halloumi will pack a salty punch. Layer the halloumi on top, and drizzle with the remaining vinaigrette. Enjoy! Serves 4. A few years ago, we got a rare day off of school due to inclement weather. My best friend and I lived just across the street from each other so we decided to celebrate with a dinner party. With the grocery stores closed, we pooled the ingredients we each had and came up with a dish we called Mountain Pie. 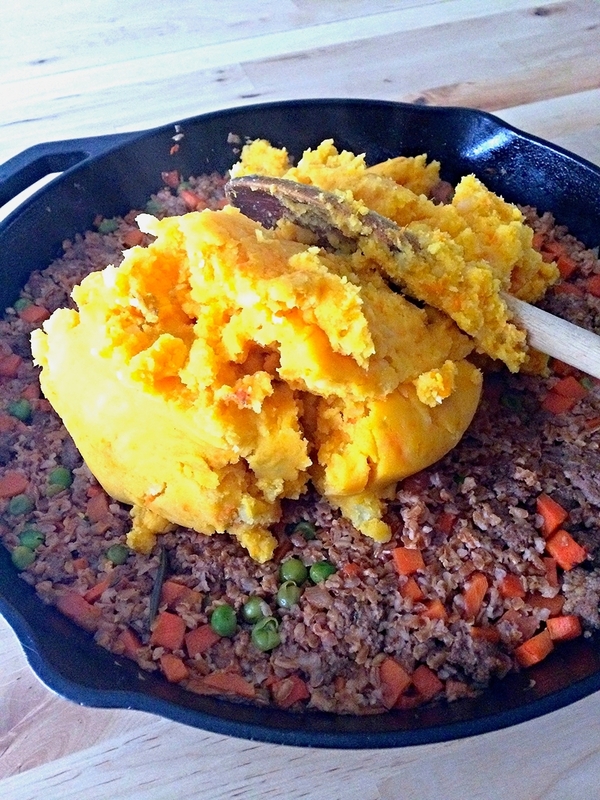 It was reminiscent of shepherd’s pie and cottage pie, but we made it with ground buffalo meat because that’s what I had in my freezer at the time, and some sweet potatoes and yellow potatoes because we didn’t have enough of one potato type to make enough of a topping. I can’t recall why we named it Mountain Pie, seeing as buffalo don’t live in the mountains, but regardless, this dish pays tribute to that Mountain Pie and to my friend. I modified our bare bones but delicious creation to make it a little more wholesome. For one, I reduced the meat by half and replaced it with seasoned bulgur which gives a nice texture similar to ground meat and provides fiber, protein, magnesium, and vitamin B-6. If you're not familiar with bulgur wheat, it's the little grain that appears in tabbouleh. I deepened the flavor with miso paste and tamari. The top is just a tad crunchy, with a smooth underbelly, and the filling is stick-to-your-ribs good. I hope you enjoy! Begin with the bulgur. Place 1 1/2 c. water in a pot and whisk in 1 T. tomato paste and miso paste. Add thyme and rosemary sprigs. Bring to boil over medium-high heat. Remove from heat and add bulgur. Cover and set aside for at least 20 minutes. 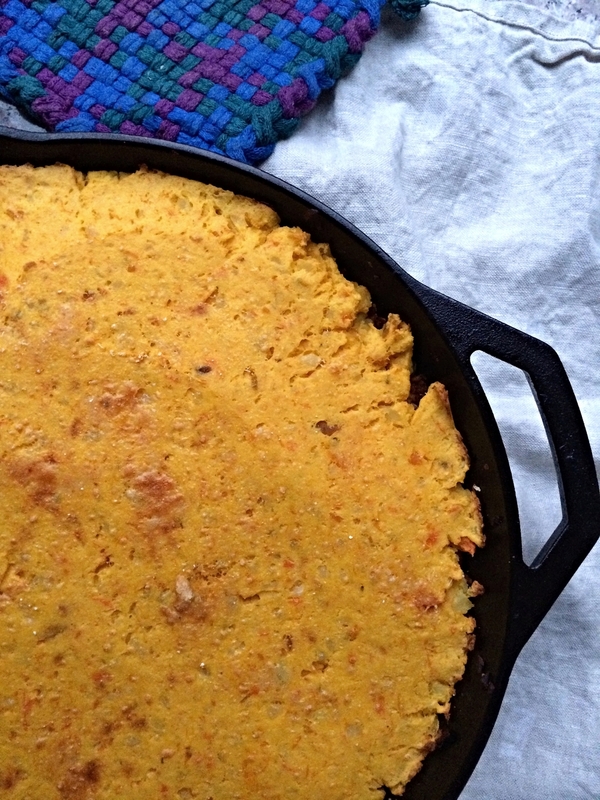 For the meat filling, heat butter or olive oil in ovenproof skillet measuring about 12 inches across over medium-high heat. Add onion and carrots, sprinkle with a pinch of salt, and saute until softened, about 5-7 minutes. Add the garlic and ground meat to skillet, and break into pieces. Again, sprinkle with a little salt. Cook the meat until brown. Add the tomato paste, soy sauce, balsamic vinegar, and flour. Stir to combine, scraping any bits from the bottom of the skillet. Add the stock or water, peas, and bay leaf. Bring to a boil, and turn the heat down to simmer and cook for 30 minutes, stirring occasionally. You want to develop some flavor while the liquid is being absorbed and the meat and carrots soften. Meanwhile, prepare the potato topping. Heat the oven to 375 degrees Fahrenheit. Place the potatoes in a pot, and cover with water by about 1 inch. 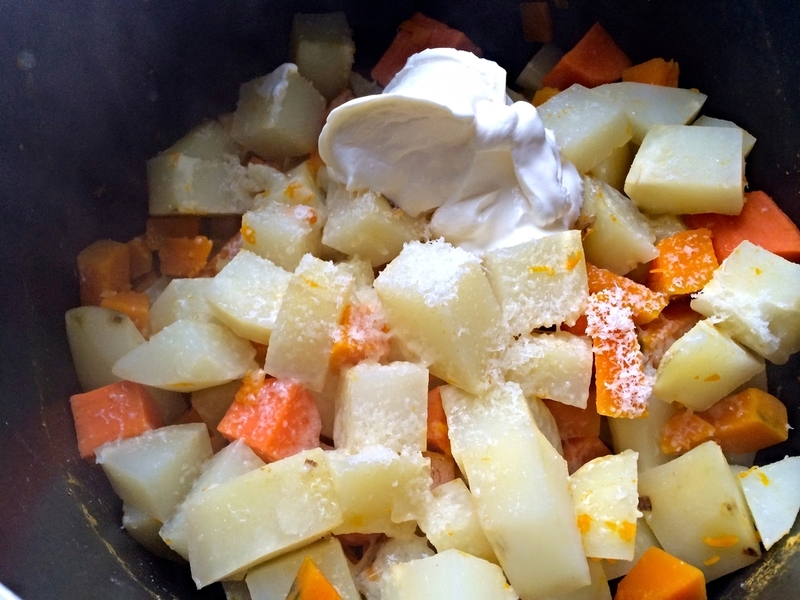 Bring to a boil and then simmer, cooking for about 15-20 minutes or until the potatoes are fork tender. Drain the potatoes, and add them back to the pot. Add the sour cream, 1/2 c. grated Parmesan, and a sprinkle of salt and mash until mostly smooth. When the beef has cooked, remove the thyme and rosemary from the bulgur, and add the mixture to the beef in the skillet, stirring to combine. Taste and adjust for salt and pepper. Smooth the mashed potatoes over top of the filling and sprinkle with the remaining Parmesan. Bake for 30 minutes. Turn the broiler to high and broil for 8-10 minutes or until the crust turns a slight golden color. Remove from the oven, and allow to rest for 10 minutes before serving. Serves 6-8 people.